JM CTE students Alexandrea Haught (right) and Brittany Smith (left) traveled to Charleston to participate in the Governor’s Workforce Credential ceremony. They are congratulated by Associate Superintendent Dr. Kathy D’Antoni (middle). More than 400 Career Technical Education (CTE) students from across the state received recognition by earning the second Governor’s Workforce Credential (GWC). Students were honored Monday for meeting or exceeding rigid criteria that measures applicable real-world and work-readiness skills their CTE programs. 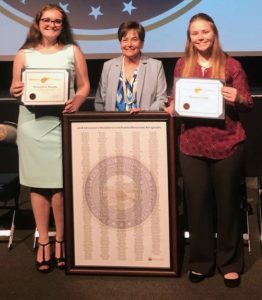 Governor Justice’s office along with West Virginia Superintendent of Schools Dr. Steven Paine, Associate Superintendent Dr. Kathy D’Antoni and members of the West Virginia Board of Education recognized the students from 60 high schools during a ceremony at the West Virginia Culture Center. Marshall County Schools had 18 students earn the Governor’s Workforce Credential. Cameron High School students recognized include Sarah Norris, Cole Quigley and Trey Scott. John Marshall High School students honored are Taylor Berisford, Stevie Boles, Dalton Garrison, Alexandrea Haught, Kelsey Kreitzer, Carli Lightner, Mason Lindner, Maggie Lyons, Kayla Millen, Keirstan Richmond, Brittany Smith, Gage Snider, Morgan Thompson, Brittany Woods and Lewis Yoho III. The GWC was created to ensure West Virginia’s developing workforce has industry-ready skills to meet high-quality business and industry expectations. Earning a GWC will allow employers to quickly identify potential employees for a variety of skilled job openings. Pass a minimum of two documented drug screenings.